I’m at the point where I’ve spent years researching two branches of my family history. List most researchers, I’ve collected what feels like a ton of paper material: birth, death, and marriage certificate, copies of church registers, census records, letters, stories, photographs, and more. While I’ve already scanned everything and keep it in labeled folders on my computer, the paper material remains…scattered. My office features archival boxes stacked with material by family, but also piles and piles of material that hasn’t been sorted. How do you organize all of your paper records? Boxes, file folders, something else? How do you label it all so you can easily find what you’re looking for? I feel like this is a huge hurdle, but there’s got to be someone who has successfully organized all this paper. We all know our ancestors can be elusive…that obituaries weren’t always printed and documents didn’t always exist. And even when records exist, they can be extremely hard to find, to confirm, to cross-reference…it can take years of research and many of us will be unsuccessful in ever finding the right connections. So this newspaper clipping gives me mixed feelings. 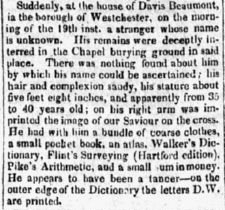 This stranger whose name is unknown is likely forever lost to history, but someone found the man’s death—or at least his anonymity—worthy of coverage. I’ve found myself “finding” a new record and experiencing that little thrill of potential new information before being crestfallen as I realize I already have that “new” record. This has happened more than a few times. I’ve blamed it on my dual data approach – offline database for verified information and online (ancestry.com) database for research purposes. But then I almost ordered a death certificate from the New Jersey archives—for the second time—and realized a much better method of keeping track of vital records and other sources was in order. My offline database does include source details, but I clearly have been lazy about proper citation so that I know *exactly* where a detail came from. I’ve also been thinking about using a checklist, like this one from Family Tree Magazine or one that I create myself, to allow a quick run down of what I have so that I can then enter the details into my offline database properly. How do you keep track of vital records and other documents? Another great resource for searching newspapers. You’ll have to view each site individually to search, but this is a strong collection. Newspapers by State – Historical Newspapers Online – Guides at Penn Libraries. Trying to keep dozens of place names in mind while researching a particular family can be frustrating. As I’ve been researching the family of Joseph C. Felver and Margaret Petty Felver of New Jersey I realized I was seeing a lot of conflicting town names — multiple places where their children were born, where they lived, etc. So, I created a Google map for the Felvers in NJ to coordinate the various place names. Anyone can create a free Google account which will allow you to create various maps. Simply find a place you want to include, drop a pin and then edit the description. I’ve chosen to add notes in the description field. I’ve also pin pointed some local libraries, etc. that may be helpful in learning more about this family. All of this will help me coordinate a trip in the future to try and dig up more information on the Felvers. via New Search Engine for Newspaper Searches. Over a million newspapers indexed!